Charles Lee was a high ranking American General who did more harm than good. Jealous that Washington was appointed Commander-in-Chief, Lee did everything he could to make his leader look bad. Eventually, Lee was given a court-martial and removed from command. Charles Lee developed his military skills as a young officer of the British Army during the French and Indian War. After going back to Europe for a spell, he decided to relocate to America. This move took place in 1773, just as the Revolutionary War began to seem inevitable. Charles purchased land close to his friend Horatio Gates in modern West Virginia. When the Continental Congress elected a Commander-in-Chief, Lee lobbied for the position. He was unhappy when George Washington received the office instead. Lee, however, was commissioned as a Major General and was the second highest ranking active member of the Continental Army. (Technically, Artemas Ward was number two, but he was too ill to participate in most of the war. Charles Lee was appointed Commander of the Southern Department of the War. He fortified Charleston for a British attack but decided to evacuate. William Moultrie successfully defended the city but Lee was given all the credit. Lee became known as the ‘Hero of Charleston’ and was rewarded by Washington with the naming of Fort Lee in his honor. General Lee returned North to fight with the main body of the Continental Army. He was with Washington when they retreated from New York. Lee took his sweet time leading his men through New Jersey and was captured. Charles was held in captivity for just over a year before being freed in a prisoner exchange. After rejoining the Continentals, Lee was ordered to attack the British as they evacuated Philadelphia for New York City. What followed is the famous Battle of Monmouth. Lee, always a thorn in Washington’s side, gave a half-hearted attempt at beating the British. He quickly ordered a disorganized retreat. As Washington approached the battlefield, he stopped Lee and gave him a severe tongue lashing. The usually calm and collected Commander shocked those who witnessed the scene. He then charged onward, rallying Lee’s men and driving back the British. Although the Battle of Monmouth was a draw (with more men dying of heatstroke than bullets), this has become a legendary moment in the life of George Washington. General Lee, for his actions at Monmouth, was court-martialed. He was convicted on a variety of counts. Lee was relieved of his command for one year, but he would never serve in the war again. He died two years later of yellow fever in Philadelphia. General Lee was one of the highest-ranking officers in the Continental Army, but his jealousy of George Washington hindered the American’s goals. Lee spent time as a captive and then received a court-martial because of his desire to make Washington look bad. If you'd like to receive a new Founder on a daily basis, remember to subscribe to my email list. 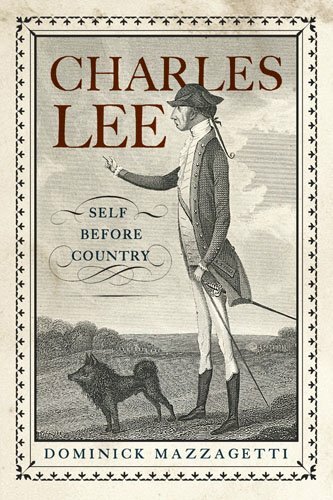 For more on the life of Charles Lee, I strongly recommend reading 'Self Before Country' which is linked below. We are affiliated with Amazon so purchasing through this link means you can support Founder of the Day at no additional cost to you.